This week we sit down with Chase Salsbury and have a candid conversation about some of the common challenges graduate students face, particularly ones that are not often spoken of outside of grad students. This is a topic that we think is extremely important to talk about and we hope you enjoy the podcast. As always if you have comments or feedback please let us know! Dr. Dae Wook Kim is the head of the LOFT group at the College of Optics at the University of Arizona. While his original background was in astronom, he came to the University of Arizona and completed his PhD in optical sciences. His dissertation covered computer controlled surface figuring for fabrication of complex large extremely large optics. From there, Dr. Kim has contributed to a wide range of academic research projects as well as fabrications of various optics, including the 4.2 m DKIST primary mirror. We sit down with Dr. Dae Wook Kim to learn about his current deflectometry and fabrication research projects, what he finds most exciting in optics right now, and what projects he hopes to do in the future. This week we discuss infrared deflectometry and its applications towards large optics fabrication. By utilizing a long wavlength, surfaces that are not reflective in the visible are able to be tested using deflectometry. Some of the challenges that went into the IR deflectometry system, including source design, geometry considerations, and source errors are discussed. Additionally, Graves comments on his experience in being part of the team that performed metrology for the 4.2 m DKIST primary mirror. Thank you for listening to this weeks episode. If you have any questions or comments please let us know. Additionally, we are always looking for new topics to cover, so please email or comment to let us know who should be in the spotlight in the future. We sit down this week with Isaac Trumper to discuss his new work on an instantaneous phase shifting deflectometry system he developed and deployed on an iPhone. His work allows for dynamic metrology of optical surfaces in an extremely low cost form. Deflectometry is a specific method used to optically measure a surface shape. The concept is based on a simple principle, if a candle is lit and we hold it at a known position in front of a reflective surface, also at a known position, and then move our eye until we see the candle, we can calculate the slope of the mirror. By doing this for all points on a mirror, we can integrate the surface slopes to arrive at a surface profile. If instead of a candle we upgraded to a screen, we can now display very complex images to illuminate the entire mirror surface at once, allowing us to calculate all the surface slopes without moving our source. A source image used commonly is a sinusoidal pattern, which is phase shifted a number of times. This pattern is presented in the x and y orthogonal directions to obtain x and y slope maps, which allows for the calculation of a complete surface map. One previous limitation to this method is that the screen had to display each phase shifted sinusoid consecutively. This is no longer the case, as Isaac Trumper recently has proven that the phase shifts can be encoded into different color channels, red, green, and blue, of the screen. 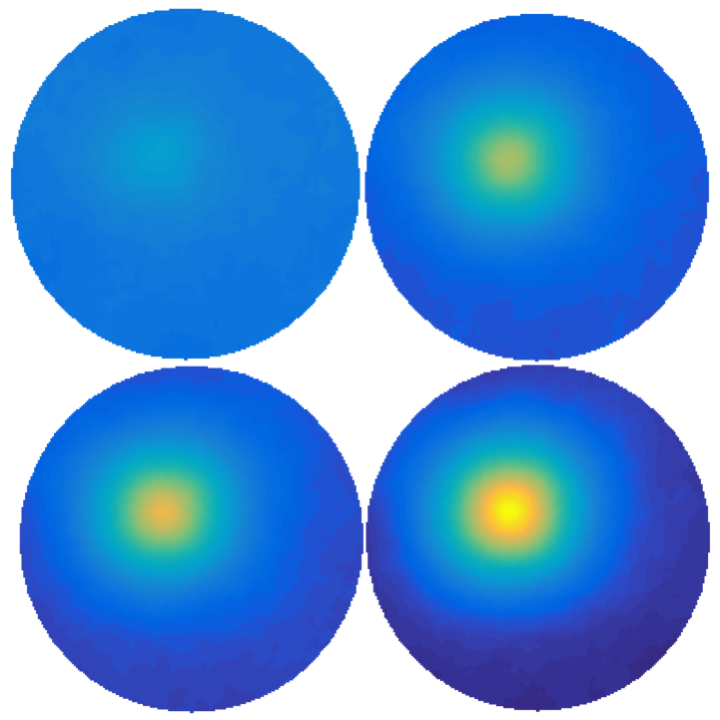 This allows for three simultaneous phase shifted sinusoids to be presented at once. Additionally, using Fourier transform techniques, Trumper was able to encode the x and y sinusoid patterns simultaneously, allowing for one screen to be showing a total of 3 unique patterns in the x direction, and 3 unique patterns in the y direction; i.e. 6 multiplexed channels at once. This allows for a single display and image capture to entirely capture all the required information to completely solve for the surface profile of your optic under test. For a complete description of the work done, please see Isaac Trumper’s recent paper, located at http://www.loft.optics.arizona.edu/documents/journal_articles/oe-24-24-27993_DKim.pdf. This week we introduce the first series for The Spotlight Report, which will be the LOFT Group. The LOFT Group (large optics and fabrication technology) focuses on metrology research, such as CGH’s and deflectometry, as well as fabrication breakthroughs, including polishing methods, materials, and control. Tune in to see what the LOFT Group is all about and to get an idea of the topics we will be covering in the coming episodes of this series! We give you an introduction of what our upcoming podcast, The Spotlight Report, is all about, and introduce you to our two hosts, Xiangyu Guo and Logan Graves.